This article, was prepared based on the presentation held at Common18, San Antonio, USA on May 23, 2018. The original presentation can be downloaded from here (click/tap). 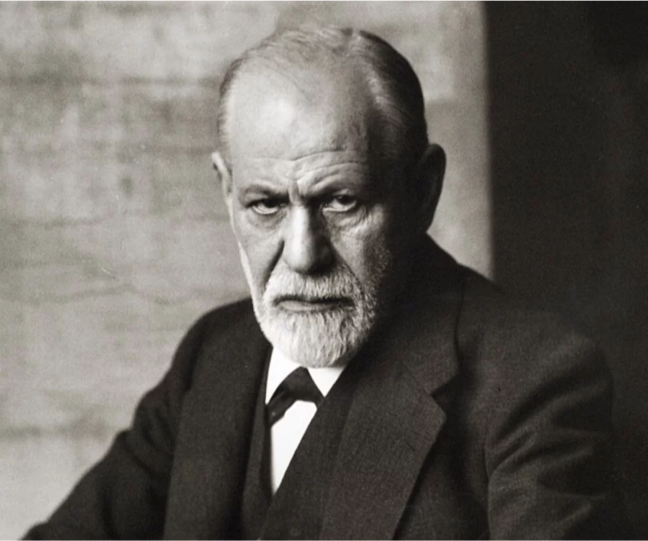 Sigmund Freud was the first pioneer when it came to understanding people scientifically. Based on the learnings of how people behave we can perform software system change just much better. Though we gave this approach a title with a tag: “agile” – this is not just another article on agile. We hope it is more. We, at iAGE (this is one of my businesses, you can see the two others here: http://www.10xone.com/ and here: http://www.secretcube.com/) have been working on information technology system change and modernization for more than a decade — we are consultants and developers at the same time, with significant experience, each of us. 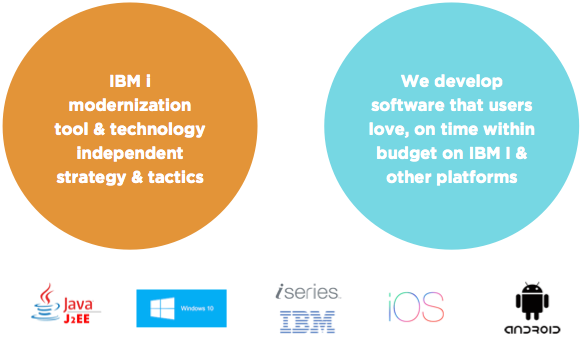 We build new technologies on the top of existing technologies. We have had 200+ projects in the past 10 years, all with 100% success rate. 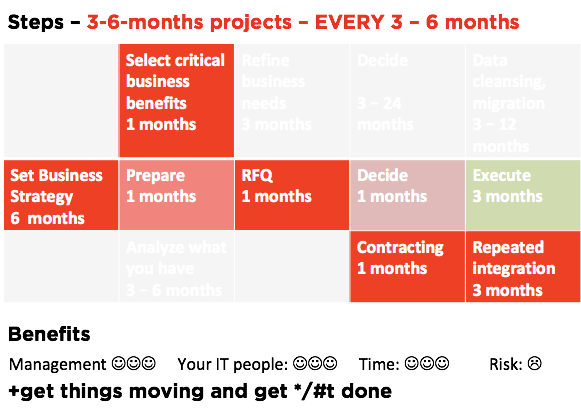 How can you have this level of project success? Firstly, we take on projects that we think we can do. This is the easier part. And the rest can be found in this article. We think that small, subtle differences do matter. 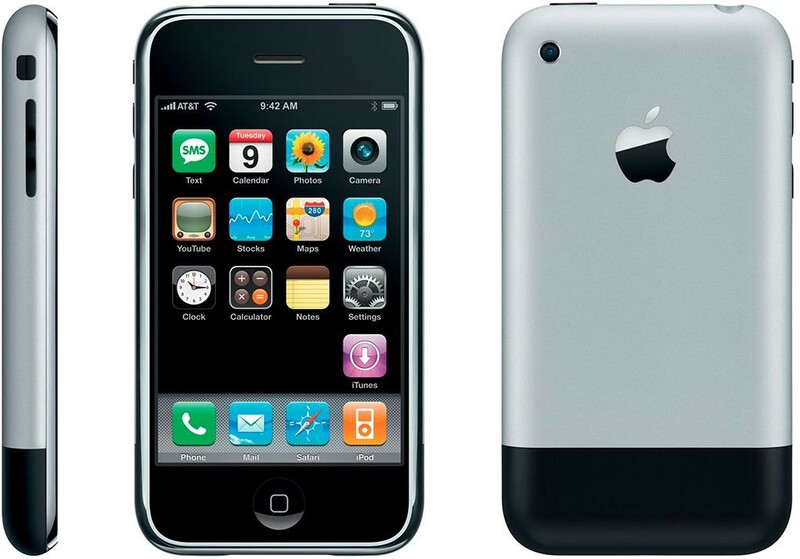 Just think of the first iPhone: there was no other real difference from the phones you had had before than the fact that there was a touch-screen instead of a keypad. The same way there must be a way to make changes to existing technologies which works better than other usual approaches. Any system design, change starts with humans. Ian Sommerville, in 1975, already had in his book () the idea that any computer system we design is a socio-technology system. “Socio” comes first, where it means “humans”. This idea is from the University of Chicago — and sociology (I am sure that not only the UoC teaches this but this thought (not the people but the situation) is a core part of many other sociology courses. In essence: it is very easy to think that people are the way they are. The fact is that they are not. 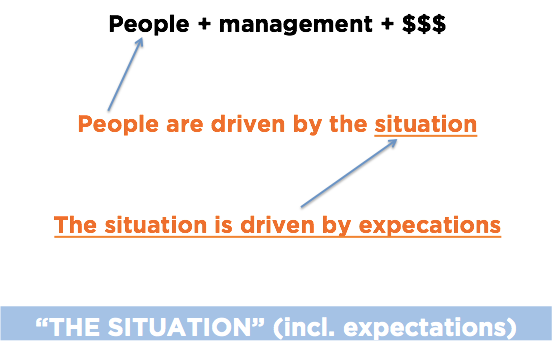 Very often how we behave is HEAVILY influenced by the situation. What all these have to do with any IT system change? A lot! In a business we have to understand first the situation to expect any change. Jane Elliot: Brown eye, blue eye: in this experiment Jane Elliot, a school teacher, could achieve her students to perform better just telling them that “blue eyed people are better”. Then a few weeks later she changed the message to “brown eyed people are better”. This latter caused, again, change in performance: only with this message she achieved that brown-eyed students actually performed better. Similarly famous experiments are: Stanford prison experiment and the Stanley Milgram experiment. Watch them, it worths the time. 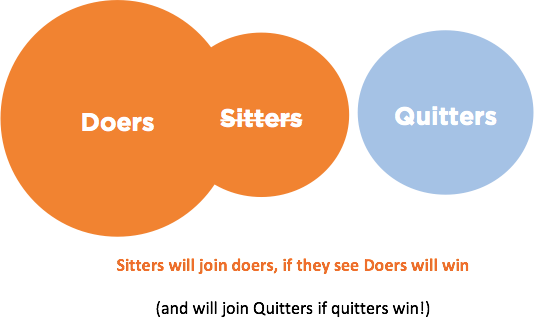 When it comes to change, there are different resulting responses — to change — by different people: doers, sitters, quitters. 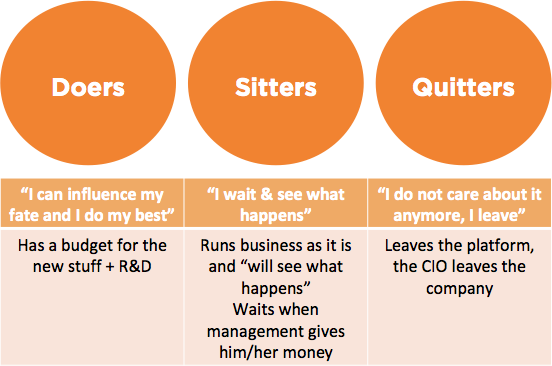 Doers will act, sitters will wait, quitters will-not that surprisingly-quit. How to become a doer? We have put together a framework — this is not a scientific framework but a collection of best practices. It is simple, powerful. It is seemingly hardly different from the one you may be using, but small, subtle differences do matter. We believe and see that “it is not the people but the situation” — this means that you have to start changes today. 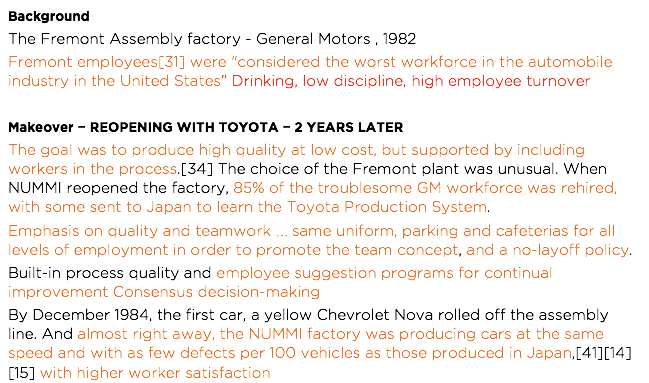 In this NUMMI example General Motors employees had been the worst ever workers in the auto industry in the U.S. When Toyota Motors took over the factory workers were not replaced by new workers, and only the change in the management methods and approach made these formerly troublesome workers into real champions. Our good example is an international leasing company in Mexico City: when we took over software development they had 100’s of unresolved RFC’s with severe delays etc. — we introduced our agile methods, took over some software development work to establish good practices and trained and empowered local people. In 6 months all RFC’s were resolved and IT people as well as users were definitely happy. We only changed the situation. 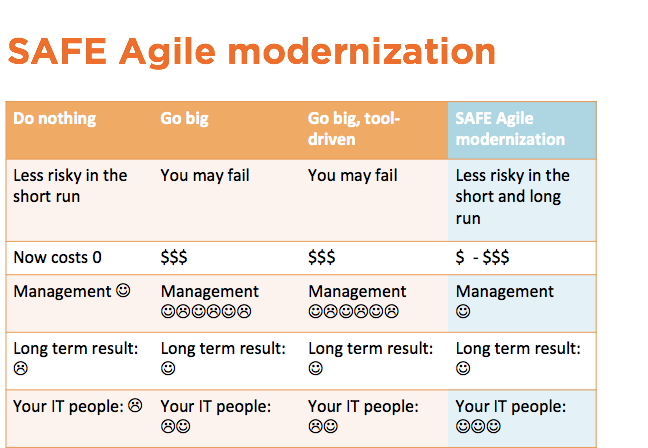 Agile IT management: Firstly, if you are in IT management: you must be a role model: you have to be fast, focused and show up that you do experiment with things-this latter means, as well, that you can make mistakes. A small note: being a role model means, as well, that you as a technology leader MUST use the latest technolgy be it the latest iPhone / Android (yes, the top-top device) or laptop. You have to lead by example. And: you have to be fast: be it typing fast or making decisions fast (ok, it is not ALWAYS possible, I know). 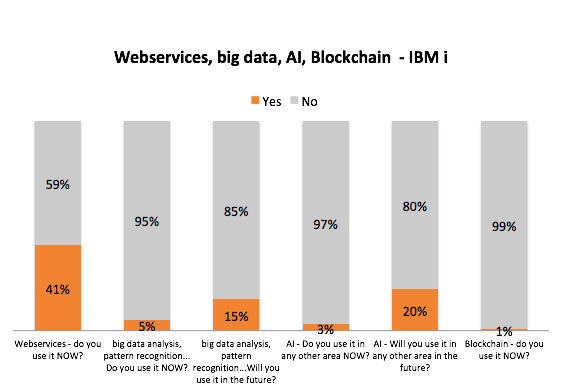 Add as a new KPI: the number of fundamentally new technologies tested / tried / piloted / used per every 6 months. Do it before your CEO asks you to do so. 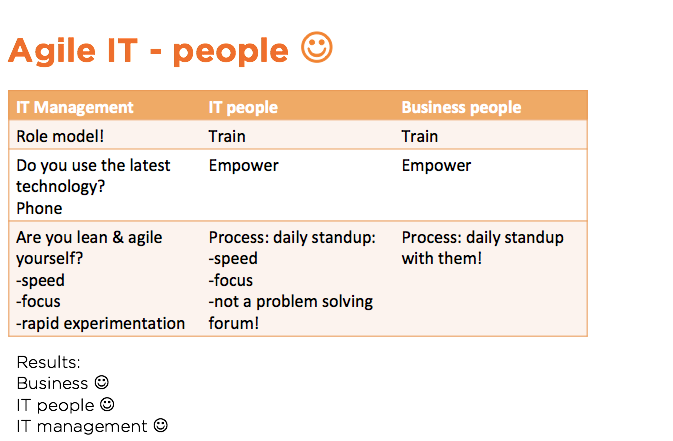 Agile IT people: you have to expect the same (speed, focus, experimentation) and help them to act similarly. Again: it is all about the situation. You do not only have to say but incentivise your people to act the same way. E.g. encourage people to experiment. Do not punish them for mistakes. Encourage them to have more and more new ideas, projects in any given period of time. Daily standups: One important aspect of agile people management is daily standups. We highlight this as this in itself is a means for fast-paced communications and setting priorities daily. This, again, shows as well to people that “yes, speed is important”. Stick to 15 minutes per day, maximum. And: do not solve problems during this 15 minutes-just update on status and collect tasks. There are multiple approaches to IT system change. 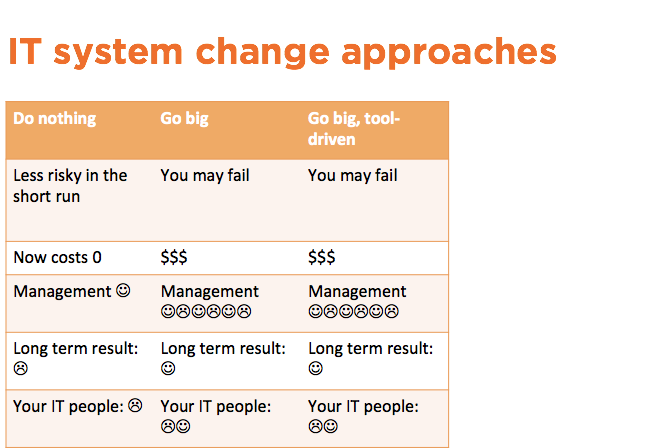 In today’s world the bigger the change is the more certain it is that the change will not happen (“do nothing”) or if it happens the IT department will apply a “Go big” approach, be it tool-driven (when there comes a big technology vendor and sells its tool and then the IT department implements it) or tool-independent. In theory this is easy, just like brain surgery: it is just 3 steps: you open the brain, operate it, close the brain. In practice it looks different. Much different. Hence the 24–48 months long projects. 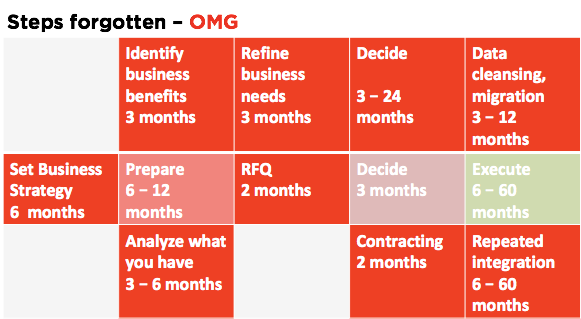 In SAFE Agile you do have: strategy, pre-planned architecture of systems, planning and there is documentation! 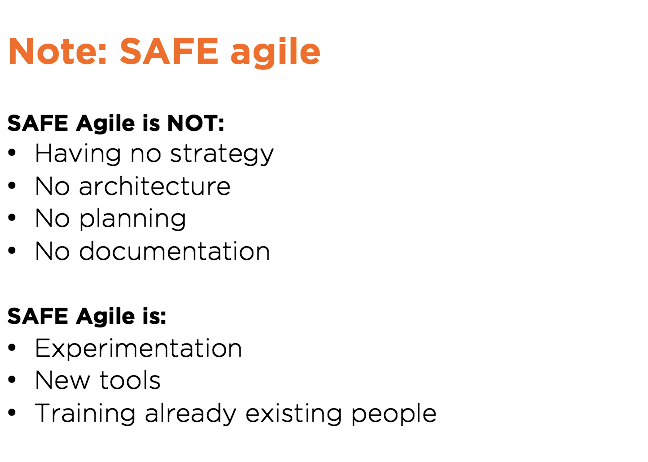 Besides, SAFE Agile is not a one-time system change project but it is an ongoing process. Please note that the entire document is 1 page only — on purpose. This is to ensure that more time is spent on actual thinking than writting. In essence the essence is what is essential. Got it? 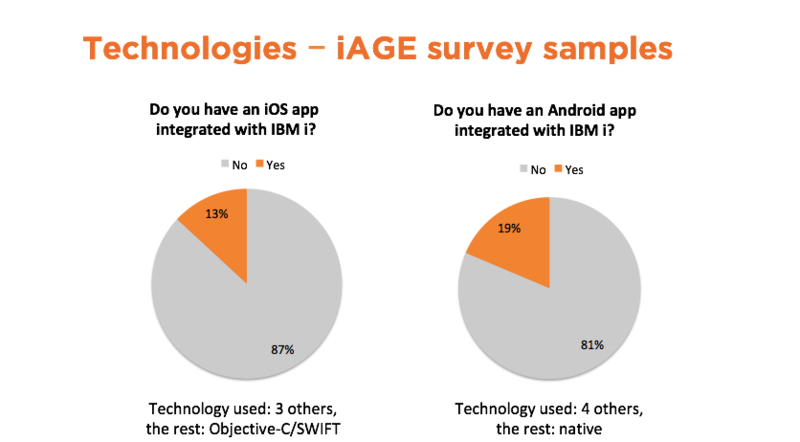 What is just as surprising is the low level of AI and big data adoption. And the still low level of AI and big data planned use in business. This is surprising, given the fact that there is a significant amount of tools available. Sure, business applications must be identified first. Blockchain: to store information in a way that it cannot be falsified by whatever means. Workflow: this is not that new but it is still missing from several older tech stack-shops: to automate processes and unify how processes are executed. A combination of human and automated workflow steps is possible, as well. Big data: to run analysis and get results on very big (TB’s or PB’s of data) data sets, fast. Objective: to learn what you do not even know. 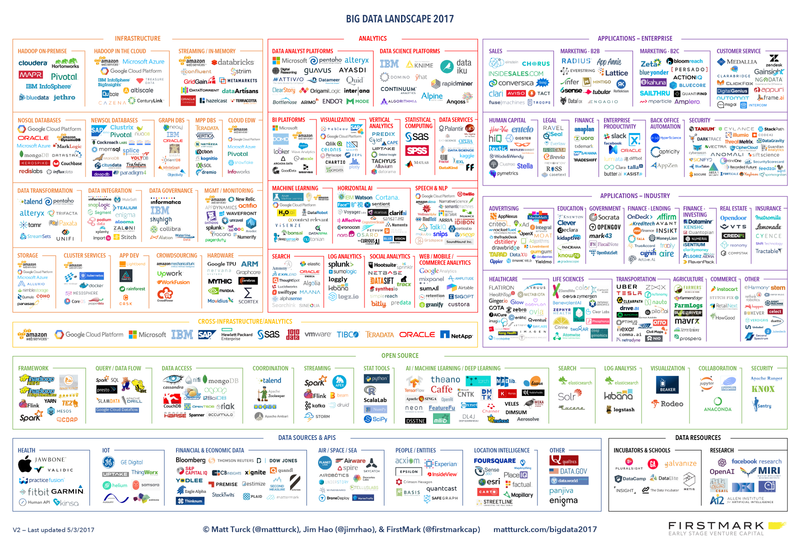 Our favorites are Tensorflow and Apache Spark (these are excellent and free tools supported by a huge community) but there are many many great other tools available. 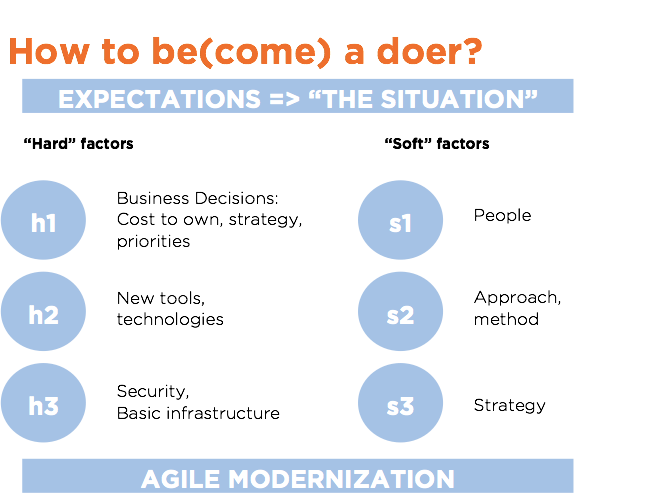 Be a doer, show example to others: become a role model: use the latest tech, experiment, research, add “add fundamentally new technologies every 6 months” as a KPI and believe that your current people can change. Instead of sitting or quitting, DO!